The Whitehall is an American Foursquare that was sold by Sears for over a decade. Sadly, there are only a few Whitehalls left in the Chicago area. Researcher Cindy Catanzaro recently was in the Chicago area, and we did a super-fast tour of Lake Forest, on a hunt for Sears houses. Our big discovery was a Sears Whitehall. 1203 Griffith Road, Lake Forest. 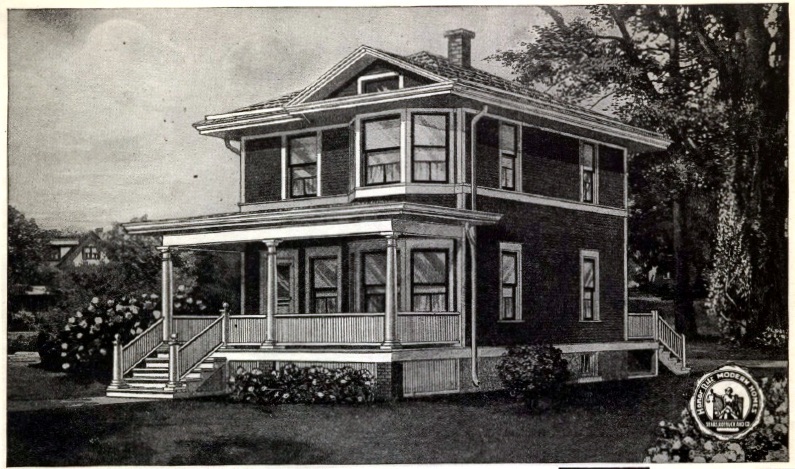 Sears Whitehall from the 1922 Modern Homes catalog. You might think the Whitehall would be easily recognized by its two-story bay window. However, the Whitehall is a model that is often re-muddled over time, with residents enclosing the front porch and removing the bay windows on the lower floor. Based on the catalog illustration, I thought the Whitehall wold be a big, imposing house. It's not. It's only 22 feet wide and not particularly tall either. The county says the Whitehall in Lake Forest was built in 1914, which is in the realm of possibility. The house is a local landmark in Lake Forest. 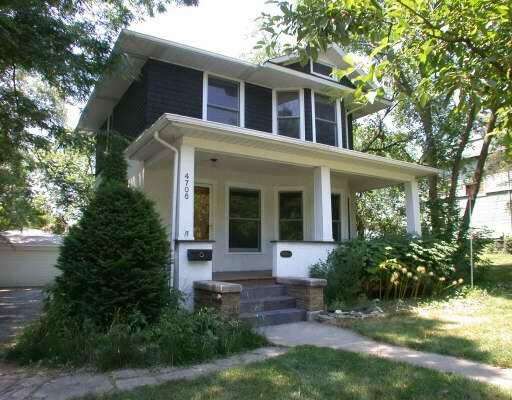 The Downers Grove Whitehall is a rarity--it has the front porch intact! This is one of my next local conquests. All the two-story foursquare variations. So far, I've only been able to absorb one style at a time. Currently trying to master 'swoopy roof' houses (I can get technical here, right?). Do you think that what you said about this house applies to a lot of others: that they are a bit smaller than you think they are from catalog and ad pictures? Hi, Robb! That's a really good question. The Whitehall was really smaller than I thought. 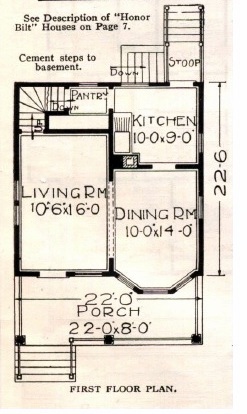 Obviously the floor plan shows it only has three rooms per floor and it's only 22'x22', but I think the bay windows in the illustration fooled my eye and made me think it would be taller. I think it just shows how your eye can be fooled by some of the catalog illustrations and the fact the houses are often shown out of context. I wonder if homebuyers were disappointed when they built their Whitehalls and found out they looked more imposing in the catalog! I guess that's why Sears encouraged people to go see the houses built in their area before they purchased. Lara, I thought the same thing when I finally saw a few Whitehalls in person this summer, when we visited Carlinville. I love this model! I, too, though, expected a taller, bigger house. This one is a beauty! Great photo of the Whitehall in Lake Forest. I've got a picture that looks just like it. There are quite a few Sears models I've seen that are smaller than what I expected. I learned to identify so many more models just by driving by ones that other researchers located.